The seventh-day Shabbat (Sabbath) is not only central to Israel’s calendar, it is at the heart of Jewish identity. Exodus 31:13 reports Adonai commanding Moshe to “speak to the sons of Israel, saying, ‘Surely, My Shabbats you must guard, for it is a sign between Me and you, to your generations, to know that I, Adonai, am sanctifying you….’” Yet the observance of Shabbat has historically been shrouded in rules and customs that can separate us from the very Shabbat we are supposed to be protecting. Beautiful, elegant—some-times strict—and infused with spiritual symbolism, the Shabbat traditions of Judaism nevertheless (and unnecessarily) complicate what may arguably be the simplest thing in Scripture. While the practical out-working of Shabbat in the modern Diaspora does take some amount of forethought, the principles set forth in the Scriptures are easy to understand and apply—if we will only hear them. Indeed, wedged in our thinking is the belief that Jewish religion and culture supercede Scripture, and that centuries of practice amount to expertise. Not necessarily. What do you think? Post a comment below. This “Fast Foundations” article was originally published in Messianic Jewish Issues. God never ceases to blow my mind. 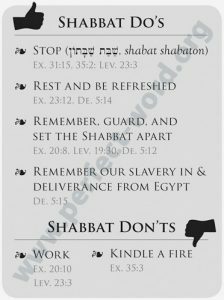 Just days ago I was pondering what Shabbat truly meant and what sacred assembly or Holy convocation really meant. And here comes Kevin writing on the Shabbat. Though I am still unsure if one must attend a synagogue to observe the Shabbat, or at home to observe it is alright too? Hi Sandy! For synagogue observance, please refer to the footnote, above, at the end of the article. I feel that the Emissaries/Apostles and the book of Acts was very clear on the “Assembling of ourselves together.” I “was the custom” to gather together on the Shabbat and then also on the 1st day for the collection/handling of money that would come into the congregation and whatever other activities occured then as well. Several time Apostle “Sha’ul also called Paul” would teach on the 1st day. I know we ‘do’ (or don’t ‘do’) Christmas. 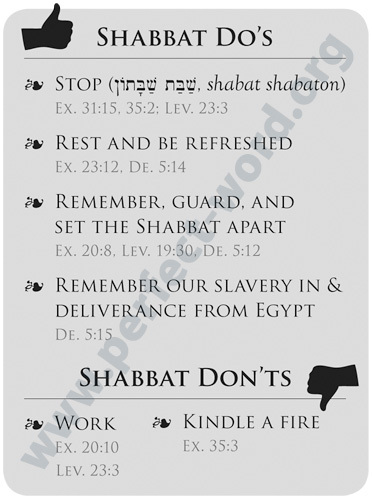 To ‘do’ Shabbat is to make of it an idol. To merely take that deep breath as one coming out of a smoke filled environment, is to simply breathe. That is Shabbat. A wonderful cleansing breath in a dank and smelly place. You get to wake up and just ‘Shabbat’ like a verb, as you respect your legs for walking, or heart for beating, You get to live, at harmony with your CREATOR on a day HE asks you to listen and fellowship with HIM. It’s a holy day set apart like you are a holy creation set apart on a set apart day. Then HE graces you with His presence as you ‘Shabbat’ together…enjoy! Reaching God Without Religion Can DNA Testing Tell Me If I’m Jewish?